Bioponics is a strange hybrid, it is the encounter of hydroponics with organics, two ways of growing plants that are at the opposite of one another. As most of you probably know, hydroponics is the practice of growing plants on a neutral substrate, or just with the roots bathing in a nutrient solution. Conversely, organic farming relays on soil as the primary source of nutrients for the plant; the whole idea is to keep the ground rich and healthy, with new organic matter being decomposed at all times to bring a renewed food source to plants. At the root level, the environement is very different from one situation to another. I managed to bridge that gap in 2005, when I patented bioponics, the use of a certifiable organic nutrient, BioSevia, in a hydroponics solution, with a substrate, but even with bare roots. 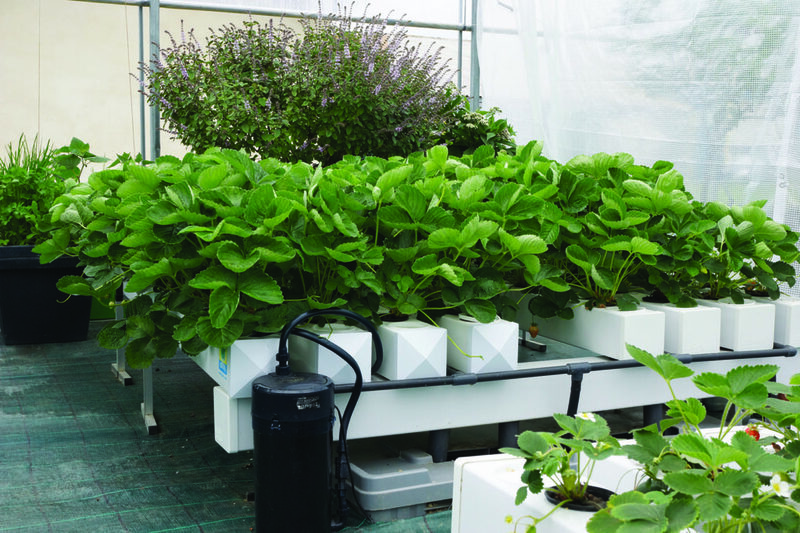 Since then, it is possible to grow organic produce using hydroponics technologies. Let’s say first that the mineral, the food source, absorbed by the plant is the exact same in both cases, but the form in which it is present in the soil or in that case in the nutrient solution is very different. When a mineral salt is dissolved in water, it dissolves in the form of an ion (an element with an electrical charge) that is directly assimilable by the plant. In an organic nutrient, the same mineral is « complexed » i.e. it is enclosed inside an organic molecule. For the mineral to be released and available to the plant, the organic molecule needs to be broken down by the action of bacteria or fungi: they break it down into its smaller components, freeing its minerals in the form of ions that the plant can intake. This process of decomposition is performed in soil by the numerous micro organisms always present. Plants complete their diet by absorbing also minerals coming from the decomposition of rocks, also dissolved in water in the form of ions. So to reproduce nature, one has to use only these 2 sources of plant food, natural rock powder and organic matters that were not submitted to chemical treatment. When one adds organic matter, even liquid, in the nutrient solution as a source for plant food, one must reproduce the same process than in soil, the breaking down of the molecules. In other words you have to introduce living organisms into the systems; more life meaning another level of complexity for you, the creator of that little “biosphere”. Indeed, micro organisms can not be controlled as easily and precisely than all the other parameters. So now you need allies, micro organisms. How to achieve that? One way is to let nature take its course. It will work with time because microorganisms are always present in the environment (even on and in us). They are in the air, in the water, everywhere; this “life” in the nutrient solution is nothing new. The decomposition will be slow and the plants may suffer until a reserve of nutrients build up in solution. It is best to speed up the process by introducing trichoderma. They are a variety of beneficial fungi that colonize plant roots, in a mutually beneficial relationship. One finds them in all healthy soils, but they are also well adapted to live in an inert substrate. They do the job very well, they are easy to source and they are not expensive. Trichoderma are fungi, and they need to cling to something in order to get established. If you use a substrate with a certain amount of coco fiber in it (or any other organic material), no problem, they will colonize it; but in case of using clay pebbles, rockwool or any other mineral substrate, you need a so called “biofilter”. It is nothing mysterious, just a well-oxygenated space containing substrates on which the micro organisms can grow and reproduce. You find biofilters in every size and shape in aquarium shops and web sites. They are usually placed on the tank. A small pump draws the solution from the tank. The solution circulates in the biofilter and cascades back into the tank. This added circulation (on top of the main pump), will be a source of extra oxygen, well needed to feed the organisms in the filter. In time, attracted by food and oxygen, other beneficial organisms will colonize also your bio filter and the root zone, making the break down of the nutrient even more efficient. Even if the pH level is less critical than in a mineral nutrient solution, you have to keep it in a range at which roots as well as micro organisms can thrive. This is roughly from 5 to 7. The pH will tend to rise, it is a natural process. Bring it down slowly; avoid shocks that damage the micro flora. Plants like stability, especially in the root zone: soils are usually very stable in pH. To lower the pH, you can use citric cid if you want to stay strictly organic, however a little phosphoric acid does not alter the taste or quality of the final crop. Avoid hydrochloric acid and acetic acid (vinegar), both toxic to plants. A significant drop in pH is an alarm bell that indicates the death of a large quantity of micro-organisms. In this case it is important to find the cause, treat it and start over with a new solution and a new stock of trichoderma. You need to keep the conductivity at a much lower level than in mineral solution. This is because as long as the mineral is not realized from the organic molecule, it does not register on your EC meter: you have more food in solution than the meter shows. Do not put too much fertilizer in your tank, a little goes a long way since it continue releasing nutrients to the plants for quite some time. Unfortunately for the manufacturer, not much nutrient is needed to achieve a nice crop. Start with an EC of 0.6 to 0.7 mS, which corresponds to around 2mL per liter of the nutrient. Raise it slowly, in the course of a week to E.C 1mS. Add more only if the conductivity drops below 0.8mS. But don’t raise it over 1mS. A large amount of organic matter in the system might have a counter productive effect, for instance by blocking roots intake. It seems easy, but you have also to be careful to give your plants all they need. One finds the optimum moment to add more nutrient also by visual examination, by looking carefully at your plants, their roots, the color and transparency of your nutrient solution, etc… Bioponics is managed by eye as much as with pH and EC parameters, although these do still remain important references. A little experience is useful to find the right dosage, but most people succeed from the first trial. Temperature, humidity, CO2 level, light, all the other parameters of the grow room are similar to those for plants grown in hydro or in soil: the basic requirements are the same. Your bioponics system and nutrient are only one piece in the complex puzzle that you have to assemble to recreate a favorable environment for your plants. Bioponics accounts only in part for the final result. It plays a vital role in the quality of the harvest, but the quantity is controlled by many other parameters. For instance, bioponics does not compensate for a lack of illumination, a depletion of CO2 or bad genetics. Humidity, a factor often overlooked, plays also a crucial role in plant health. By influencing the rate at which a plant can transpire, the relative humidity level modifies the rate at which it can intake water. The major enemy of bioponics is heat, one that it shares in common with hydroponics; but in the case of bioponics, the consequences are different. When the nutrient solution warms up, the microbial life increases tremendously in population and voracity because their metabolism is accelerated by heat. The amount of nutrient released increases tremendously. As a consequence, the electro conductivity can go off the roof in no time, within 24 hours even, and this will kill the roots. This is why it is wise to keep a low EC when you grow in bioponics. Bioponics is a very economical way of cultivation since the consumption of water and nutrients is a fraction of the one needed by any other type of growing technique: Organic looses water in the ground, hydroponics grows an unnecessary green mass. Bioponics production is based on the idea of sustainable agriculture. The goal is to give less nitrogen to the plant, and shift the balance in favor of the flowering and fruiting stages, rather than the vegetative growth, which may be bountiful but end up being just another addition on the compost pile. Also, you do not need to change the nutrient solution often during the crop, once every 3 weeks or even a month is enough. Your nutrient solution should not be discarded, if used to water plants in soil, be it in pots or in the garden, they will greatly benefit from it. You can let the solution drop to a low level, minimizing the volume of solution to be renewed; beware however not to accumulate too much organic matter in that little volume. In terms of quality, the product harvested has the same taste, and nutritional value, than the best organically soil grown produce; they are impossible to differentiate. It might taste even better since bioponics removes a few of the barriers that limit plant growth. In bioponics the plant can express its full genetic potential. The choice of the varieties you grow has a major influence on your final result. In terms of quantity, the yield is lower than when using minerals, as it also happens in soil; but one of the advantages is that your turn over is much faster than in soil, so you can make more crops per year in a bioponics system than you could in even the best organic soil. Bioponics has the added benefit that its large microbial population becomes a formidable barrier against pathogens. Roots are protected effectively by a huge army of beneficial organisms; no pathogen can develop. If you keep them well oxygenated, the roots stay healthy, immune to fungal attack! But oxygen is really the key word, more even than in traditional hydroponics because everything in your systems consumes it: the roots as well as the micro organisms. Often you have to add a powerful air stone in the main tank to keep the solution well aerated. In hydroponics, the root morphology is different than it is in soil. In hydroponics, the plants develop what we call “water roots”, usually thinner and more tender than soil roots. 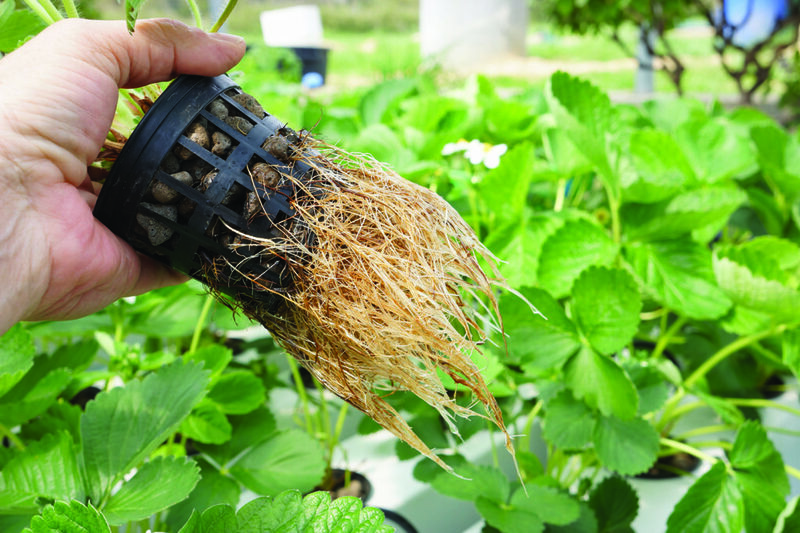 Bioponic plants grow roots that are sturdier, a true hybrid root between soil and hydro. Performing comparison tests between plants grown in classic hydro versus bioponics, I often witnessed that root disease develops in the mineral fed plants, almost never in the bio fed ones, even in systems side by side, growing the same plants. 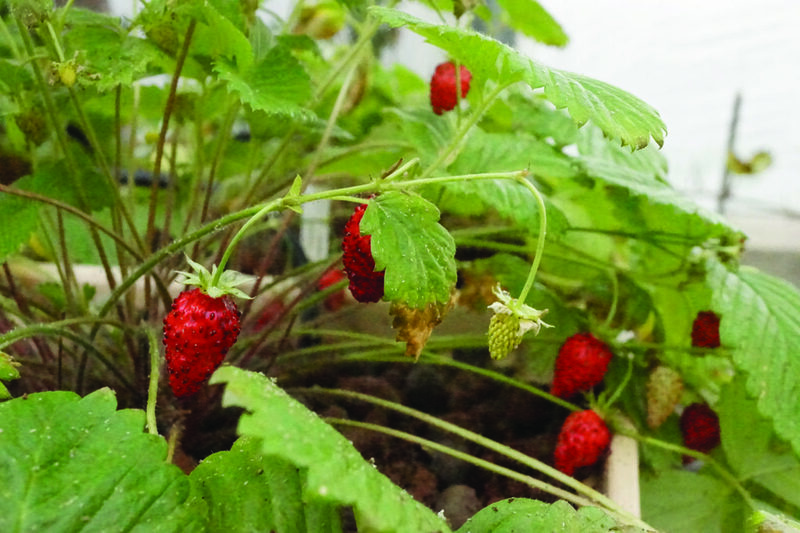 Bioponic plants are slightly smaller than traditional hydroponics ones, but they are definitely stronger when it comes to resist root pathogens. Since 2005, bioponics has been experienced by many growers, hobbyist as well as professionals, in the vast majority of cases with continuous success, and I learn about that new technology also through their feed back. In our research greenhouse, we are still using minerals for a certain number of tests, but we always have something running in bioponics, and we are shifting more and more to it. It is such pleasure to witness the plants grow so healthy and so fast! Try it, I am not sure that you will think of hydro (or soil!) in the same way after that.